A penny dropped from the Empire State Building would not kill someone standing below, most likely. The observation deck is 1050 feet high, and the penny would reach a maximum velocity of 57 miles an hour after falling 500 feet. That’s enough to hurt pretty bad, but only a very very lucky (unlucky) shot would kill you. Most importantly of all, there is an updraft. Tossed coins generally land on the setback roof of floor 80. The reward mechanism involved in addiction appears to regulate lifelong social or pair bonds between monogamous mating animals, according to a Center for Behavioral Neuroscience (CBN) study of prairie voles published in the January 19 edition of the Journal of Comparative Neurology. The finding could have implications for understanding the basis of romantic love and disorders of the ability to form social attachments, such as autism and schizophrenia. Here is a left-wing list. Here is a National Review list, with Hayek and Robert Conquest near the top. Here are two Random House lists. The critics elevate Henry Adams, William James, and Booker T. Washington. The readers favor Ayn Rand, L. Ron Hubbard, and John Lott. The readers’ list has all kind of libertarian books, including David Boaz and Tibor Machan. I find it deeply amusing that the top two books on the Random House reader’s list are The Virtue of Selfishness , by Ayn Rand, and Dianetics , by L. Ron Hubbard. As a rule, the reader’s list is full of highly ideological texts — a surprisingly large number of libertarian texts, many left-wing texts, and a few conservative texts. Naturally, the National Review list is full of conservative texts, including many Christian works. The left-wing list seems almost laughable — at least to me. A high school freshman who walked out of a weightlifting session after being called a weakling became a hero minutes later when he saved an elderly man who had driven into a pond. Justin Gregorich, 14, was one of three people who jumped into the water Wednesday to pull Raymond J. Kane from his sinking Lincoln Town Car. “It’s amazing — there are snakes and there are alligators … all three of them just jumped in right after that guy,” said paramedic Mike Eash. Gregorich then woke up from his dream. An American tourist who splashed a cup of water over a crying baby on a flight from the United States headed back home two days after being barred from entering Brazil, police said on Friday. Ronald Duffy, a 35-year-old from Pennsylvania, had been denied entry to the country on Wednesday morning because of the incident and was then kicked off another flight back to Miami on Thursday after he began misbehaving again before take-off. He eventually left just before midnight on Thursday after spending most of the day in police custody, a police spokeswoman said. Duffy had planned to spend Carnival in the northern city of Salvador with his Brazilian girlfriend. His woes began in Miami on Tuesday. American Airlines refused to board him on its flight to Sao Paulo because of his behavior at check-in. He got on a TAM airlines flight and found himself sitting by a couple with a baby. Annoyed by the toddler’s crying, he asked for a cup of water then doused the baby with it. He said he had wanted to sleep. Police said later he was drunk. Duffy narrowly avoided being beaten up by other passengers and was arrested — to applause — when the plane landed in Sao Paulo. The decomposing remains of a 60-ton sperm whale exploded on a busy Taiwan street, showering nearby cars and shops with blood and organs and stopping traffic for hours, local newspapers said. 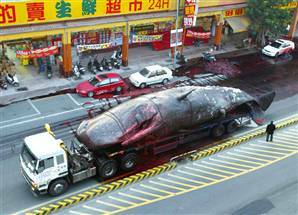 The 56-foot dead whale had been on a truck headed for an autopsy at a university earlier this week, when gases from internal decay caused its entrails to explode in the southern city of Tainan. Real tea, and the type researchers are focusing on, comes from the Camellia sinensis, a white-flowered evergreen shrub. But the shade of the tea depends on the picking and processing of the leaves and buds and their contact with oxygen. Black teas such as darjeeling and ceylon result when the leaves are fully fermented, while oolong comes from partially fermenting leaves. Green tea results from withering, and then heating, dried leaves at a very high temperature, while white tea arises when the plant’s silver-haired buds are plucked by hand in late March before blooming, air-dried and steamed. One potential downside of all the early screens is that they don’t detect other genetic abnormalities found by amniocentesis, including Klinefelter’s syndrome and Turner’s syndrome. About 50% of the time, a mother chooses to abort when an amnio finds those disorders, Dr. Wapner says, though both are less serious than Down syndrome. Klinefelter’s, which affects only boys, causes infertility, a feminized body shape and sometimes mental retardation. Turner’s syndrome, which affects only girls, results in a short stature, webbed neck and some mental retardation. [T]he difference in life expectancy for men and women decreases significantly as people get older. At birth, for example, a woman’s life expectancy in the U.S. is 79 years, compared with 73 for men. But most of the difference can be accounted for by the fact that men are more likely to die between the ages of 20 and 45. Democracy has had a good run in the past decade and a half. It put down roots, albeit often shallow, across much of the former Soviet Union. It swept apartheid from South Africa, communism from Eastern Europe, dictatorships from South America and political machines from Taiwan, Indonesia and South Korea. Yet democracy has sometimes empowered the intolerant. The big winner in a December election in Serbia, for instance, was an ultranationalist party allied with ex-President Slobodan Milosevic, now on trial in The Hague for war crimes. Mark A. Walker and John C. Wooders, economists at the University of Arizona, recently studied old videotapes of tennis matches involving stars like Bjorn Borg, Ivan Lendl and Pete Sampras. The economists looked at the serves in each match to see how well players randomly altered playing the ball to an opponent’s forehand or backhand. Many people do poorly on similar tests when they are conducted in a laboratory. Ask somebody to write down a list of hypothetical coin-flip outcomes, for example, and the result will probably contain too few streaks of heads or tails. Because people know that the overall odds are 50-50, they underestimate how often three straight tails or four straight heads turn up. But professional tennis players realize, on some level, that their opponent will have an advantage if he knows that a serve to the forehand is likely to be followed by one to the backhand. They do a relatively good job of mixing serves, though still not as randomly as a computer program would, Professors Walker and Wooders reported in a 2001 paper. Could a little poison be a good thing? Evidence is building for hormesis, the theory that suggests that moderate doses of bad things like radiation and toxins can improve health. Interestingly, much of the evidence has been around for a long time but it has been ignored because the focus was on proving the harm that toxins can cause and because low-dose effects are, by their nature, harder to identify so positive effects at low doses were typically discounted. The stress triggers cellular repair and maintenance systems. A modest amount of overcompensation then produces the low-dose effect, which is often beneficial. This idea may sound bizarre, but such adaptation to stress is common, says physiologist Suresh Rattan of Aarhus University in Denmark. Exercise, for instance, plays biochemical havoc with the body: starving some cells of oxygen and glucose, flooding others with oxidants, and depressing immune functions. “At first glance, there is nothing good for the body about exercise,” he notes. But even couch potatoes know that moderate exercise is worthwhile. Rattan says that the cellular insults from exercise prompt the defense system to work more efficiently. For example, the prevailing theory is that any increase in radiation exposure increases the risk of cancer. But biologist Ronald Mitchel of Atomic Energy of Canada has shown that a single low dose of ionizing radiation stimulates DNA repair, delaying the onset of cancer in mice; high doses produced the opposite effect, as expected. Prolonged exposure to extreme temperatures is also harmful, but Rattan has found that heating up human skin cells to 41 degrees Celsius (106 degrees Fahrenheit) twice a week for an hour slows aging in the cells. Even well-established environmental headaches display some hormesis. The definitive rat study that linked high doses of dioxin to cancer, published in 1978 by Richard Kociba of Dow Chemical and his colleagues, also found that low doses reduced the incidence of tumors. Calabrese suspects that in many cases, the benefits of hormesis may occur at levels higher than the recommended safe doses for humans. The U.S. Food and Drug Administration, with its costly and time-consuming drug approval process, is a big reason Americans pay far more for medicine than consumers in the rest of the world, U.S. Nobel laureate Milton Friedman said on Tuesday. “The FDA is the most serious situation regarding the high costs of prescription drugs in this country,” Friedman told a San Francisco forum on U.S. importation of Canadian drugs. “Their (the FDA’s) whole incentive is to be ultra-careful, to not make a mistake … but that’s where the problem starts,” said the economist, one of the most prominent free market advocates the past century. In The Office, British comedian Ricky Gervais plays David Brent, a buffoonish, self-involved but affable office manager at a dismal paper supply company called Wernham Hogg, in the London suburb of Slough. Gervais created the faux documentary and co-writes and directs the series, which appears on the BBC and has a small cult following on BBC America. The 61st annual Golden Globe Awards ceremony is tonight, and Gervais is up for a Golden Globe award in the Lead Actor category. He speaks with NPR’s Liane Hansen. Insight denotes a mental restructuring that leads to a sudden gain of explicit knowledge allowing qualitatively changed behaviour. Anecdotal reports on scientific discovery suggest that pivotal insights can be gained through sleep. Sleep consolidates recent memories and, concomitantly, could allow insight by changing their representational structure. Here we show a facilitating role of sleep in a process of insight. Subjects performed a cognitive task requiring the learning of stimulus-response sequences, in which they improved gradually by increasing response speed across task blocks. However, they could also improve abruptly after gaining insight into a hidden abstract rule underlying all sequences. Initial training establishing a task representation was followed by 8 h of nocturnal sleep, nocturnal wakefulness, or daytime wakefulness. At subsequent retesting, more than twice as many subjects gained insight into the hidden rule after sleep as after wakefulness, regardless of time of day. Sleep did not enhance insight in the absence of initial training. A characteristic antecedent of sleep-related insight was revealed in a slowing of reaction times across sleep. We conclude that sleep, by restructuring new memory representations, facilitates extraction of explicit knowledge and insightful behaviour.